STAT Audio is a brand new Italian HiFi Company, located in Frosinone. Its catalogue offers just two products (by now): a high sensitivity tower loudspeaker and a 50 watt solid-state integrated amplifier, the S201 I'm going to review for you. A preamplifier is in the works, also. The S201 integrated amplifier is a fully solid state design sporting a complete dual-mono architecture. The power stages are DC-coupled while global feedback has been kept quite low (12 dB). Passive components are of very good quality and so is the massive aluminium cabinet. Every function (on/off, inputs selection and volume) is easily controlled by means of a user-friendly remote. The unit under test is almost a prototype, especially from a structural point of view. 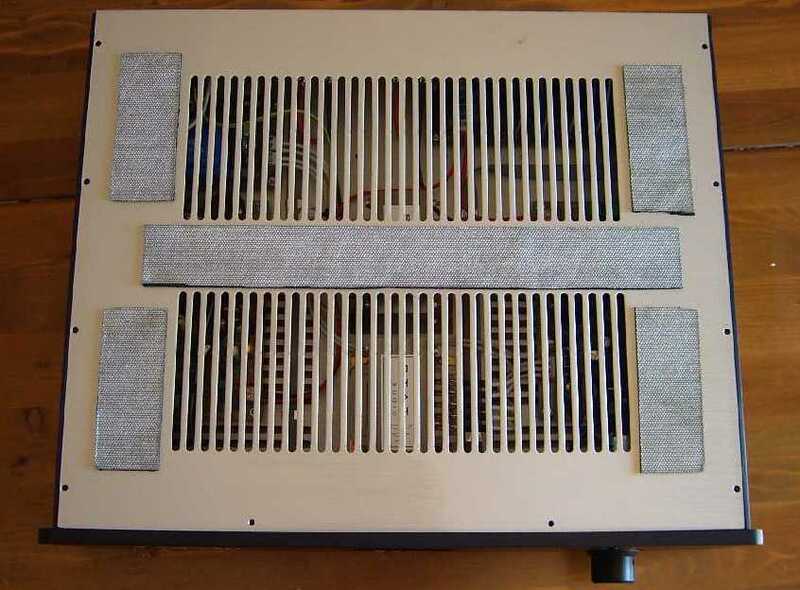 While the amp was under test, the manufacturer improved some areas of the cabinet, in order to make it structurally stiffer and less resonant. Its "heart" has been left unchanged. The S201 is very user-friendly: easy to use, handle and operate. Certainly the complte remote control makes everything easier. 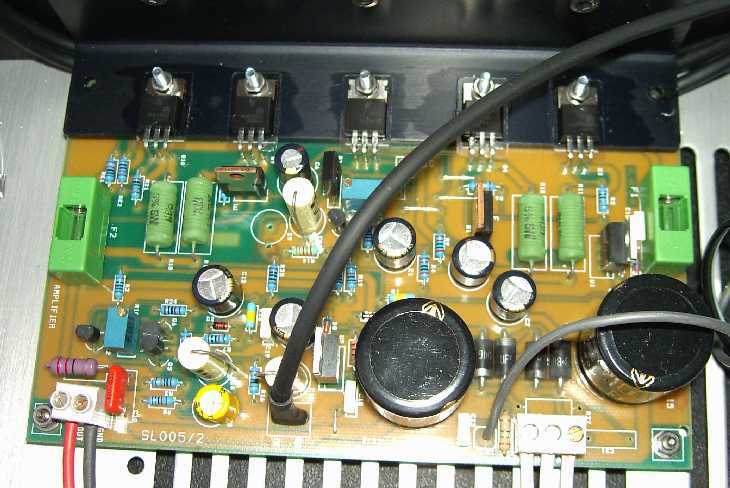 This amplifier has 5 line level inputs (no phono! ), very good RCA females, speakers binding posts and an IEC-standard mains inlet with a power-on switch. It is wider than usual, being 45 cm (instead of 43) but thanks to its simple and elegant black satin finish it is still quite unobtrusive. A small, glowing red led display indicates which input has been selected and the operative mode (on or stand-by). On the inside one can notice the extremely clean and well thought layout, made with good quality wires. The first thing that catches the eye is the unusual presence of two traditional power transformers in lieu of the ubiquitous "massive" toroidal transformers. Certainly, the designer has choosen traditional transformers for some good reason. Actually, toroidal transformers aren't always "better", as the usual audiophile common sense and attitude may suggest. The power supply stage makes use of a pair of gold series 4700 uF Kendeil caps per channel. The PCBs are signed with the designer's name. The volume pot is a classical, good blue-series ALPS. Everything has been designed and hand-made in Italy. The STAT Audio S201 has been tested for several months and compared, besides my usual references, with two Italian similarly-priced integrated amplifiers I've recently reviewed, the Monrio MC 207 and the Audiosophia I-50 jm. The usual, embarassing, Sonic Impact T-Amp was also available. It should be said that the three Italian amplifiers share the same power output (more or less) and price tag (1500 €) except the Audiosophia that costs 500 € more. No matter how hard I tried, STAT Audio designer Sebastiano Lombardo told me very few things about his own way to HiFi designing. He said he believes a good product should offer precise electrical "measures" but these can't justify everything. Also, good components should be used only where they can make a real, audible difference. He is against the usual high-end attitude to use over-sized components in unnecessary areas, such as massive power supply transformers on small preamplifiers or CD players, just to satisfy audiophiles' feticism. I was curious to know something about his thoughts and "references" because this amplifier has a very STRONG character that can't be obtained just "by chance". For sure, its peculiar sound is the result of very particular choices (and musical taste). Which character you ask? Well, I've found the S201 a bit on the warm side, with a somehow amber-like mid and high range. A touch of thin, black velvet seems to cover everything. Just to give you an idea I'm forced to make a comparison with a well-known Italian product: Audio Analogue. If you know the way many Audio Analogue components sound, you can understand the tonal balance of this STAT Audio S201. Not that this is a clone but if you twist my arm and ask for the closest sounding amplifier I can think of...I'd say Audio Analogue Puccini. Compared to the two amps I've recently tested, the S201 doesn't have the fresh and somehow "crisp" sound of the Monrio MC207 and for sure doesn't offer the neutral performance shown by the Audiosophia I50jm. When compared to the T-Amp, the S201 is almost antithetic: while the small Tripath-based amp is precise, dry and hyperdetailed, the S201 is smooth, warm and sweet. The bass range is sufficiently precise and controlled, even a bit "shy" in the first two octaves. A kind of lightness makes the electric bass fundamentals and the lower pipe organ notes a bit thinner than they should be. The result is a certain lack of "pathos". Both the Monrio and the AudioSophia perform better in this area. Many dry and cold recordings become almost bearable via the S201. On really demanding (yet "warm") recordings such as Massive Attack's "Mezzanine" or "Blue lines" this amplifiers sounds involving but lcks that "grunt" which is necessary most of the times. The tracks flow effortlessly but bass and synth lines lack energy and crispness. With Jazz and Classical Music the STAT Audio S201 shows all of its virtues, offering a relaxing yet involving performance, graced with a touch of "class" that reminds good high-end electronics, mostly in the vacuum tube league. Summarizing, the general feeling is that of a gentle and refined perfomer, at home with jazz and classic, a bit "grasping for breath" with rock and dynamic pop. Somehow, it still succeeds to give you a flavour of "high-end" yet at an affordable cost. Its relaxed and gentle nature has suggested me the subtitle for this article: "Evening falls...". This is a track from Enja's "Watermark" that reminds us how emotionally involving can be the end of the day, when lights fade away and our breath is in tune with the rythm of the Music we are listening. Power output and driving capability appear to be more than adequate, even with tough loads or low-sensitivity loudspeakers. Punch and impact are not its best virtues. It sounds sometimes on the slow side and while this makes its performance highly entertaining with certain musical programs, it easily becomes "too much of a good thing" when a leather jacket is required. I'm not seriously complaining about this attitude: for sure, it belongs to its DNA and, perhaps, it heavily depends on its designer's musical tastes, who knows. When playing electric bass and drums, with all the violence required by P.O.D or Rage against the machine, the STAT Audio S201 gives everything is capable of, but fails to deliver the right "energy" and "kick" in the first two octaves. From time to time, the "groove" effect is missing. You can hear the rythm but you can't really follow it. In the microdynamics department the performance is good and, when all has been said and done, I'd rate its performance as rather "precise". Perhaps it doesn't "underline" every dynamic variation but it hardly does something clearly wrong. The virtual soundstage created by the S201 is graced with an amber-like light. Don't expect razor sharp contours, though. Just imagine to be into a smokey jazz club at midnight, with a good beer in one hand and a good jazz trio jamming on the stage. Singers and players relative positions are easily identifiable but the image of each one of these is somehow "blurred". This doesn't imply the image is fluctuacting or unstable. It's firm but soffuse. I hope you get the picture. This unit is meant to stay permanently in stand-by mode, considering the power switch is in the rar. For this reason, when powered on it is ready to deliver most part of its sonic virtues. This notwithstanding, I'd recommend at least 15-20 minutes of "warm up". The unit is equipped with the ubiquitous stiff rubber emispheres used as feet so experiments with different anti-vibrating devices are strongly suggested. See for example the neverending saga of antivibration supports by our resident guru Mark Wheeler. The S201 is supplied with a cool-looking mains cord, not the usual PC-like stuff. At a closer inspection, the STAT Audio mains cable is nothing else than a shielded 3-core wire, more or less like our DIY Merlino design. Though high-end looking, the STAT Audio mains cable performed quite poorly, even when compared with one of our cheapest DIY cables. For sure, the overall performance of the amplifier, when used with this cable, was heavily affected. I'd suggest to avoid using it. Don't ask me why, apparently there's no reason for this disappointing performance...perhaps the wires (too thin), the shield or the dielectric...sincerely I don't know but if you really want to hear what the S201 is capable of, please avoid using the supplied mains cable. A standard (PC-like) mains cable perfomed better (go figure...). The STAT Audio S201, even when driving difficult loudspeakers, stayed cold...for sure the aluminium cabinet and the huge air vents play a role in keeping operating temperature on the low side. S201: finally there's room for my fingers! Manufacturing and finish. Being a prototype the cabinet showed some problem in damping vibrations. The top cover, for example, despite the damping sheets, was pretty resonant. Apart from this, I'd say the rest of the unit is pretty well designed and built: RCAs and binding posts are of very good quality and (finally!) reasonably spaced. Aestethically I've found the volume pot and the writings on the front panel absolutely "out of place". Perhaps the manufacturer should re-design these areas. The remote is easy to use but definitely BIG and UGLY. One of the worst remotes I've ever come across. The owner's manual is quite complete and detailed. 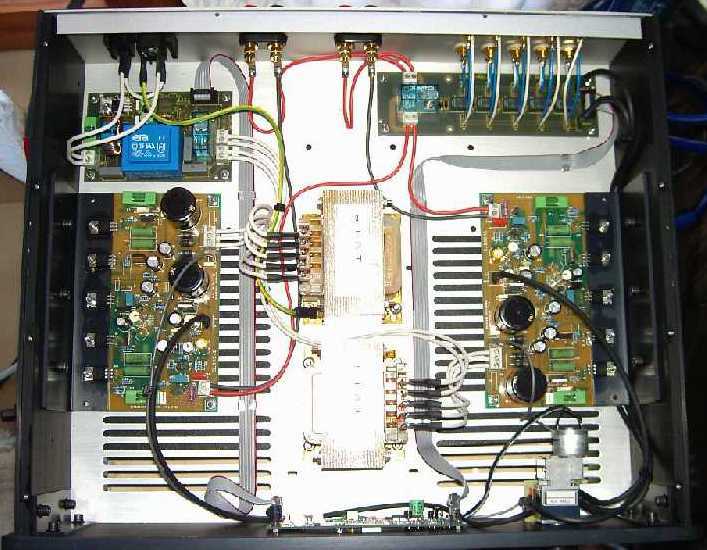 The warranty on the product is 2 years but you can extend it every two years by simply sending your amplifier back to the manufacturer for a general inspection and service. Thumbs up for this! Finally, two words about pricing. This is a very small and "new" Company. This means it still has a very limited production. Of course, this doesn't help cutting down costs. Anyway, considering sound quality, finish and features I'd rate its value for money as very high. Sound quality. This is a pleasant integrated amplifier: refined, with a "strong" smooth character, very relaxing to listen to. On my "wish list" I read a better extension and transparency in the high range and a bit more "grunt" for electrified Music. On some musical genre it simply lacks the brute force which is needed. Italians have earned a very good reputation for making nice sounding and moderately priced integrated amplifiers. Despite being a "first timer" this STAT Audio S201 is interesting. Its peculiar character will attract many audiophiles, especially those searching for a relaxed performer, "at home" with jazz and classical Music mainly. Headbangers may need to search for something else.